Jef Costello is a professional. Jef Costello is a perfectionist. Jef Costello is a hitman, and his murders are always well planned and calculated to ensure he isn't caught. Tonight is different though. Things don't go quite as smoothly. Witnesses. They surely got a good look at him. He's a man of few words but no doubt the authorities are going to make him start talking. He's guilty as sin but he's gonna need an alibi. My second Melville but it was an eye opening experience, as I had no idea just how much style the man had dripping from his confident yet restrained camera. 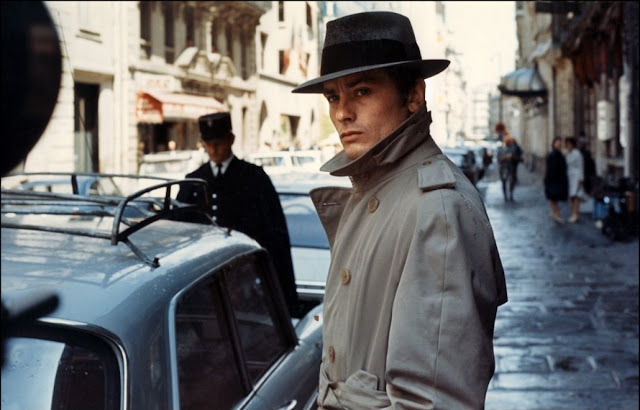 Alain Delon plays Costello with a ridiculous sense of cool, the type of leading man that is essential to make a brilliant noir. With the cold yet gorgeous aesthetic bursting through every frame and the soulful jazz music playing at just the right times, I couldn't help but wonder if I was merely a smooth drink in my hand away from the textbook definition of a sublime cinematic experience. As a fan (putting it mildly, I practically worship the movie) of the 2011 Nicolas Winding Refn masterpiece Drive, I quickly picked up on the fact that Refn was clearly inspired by Melville and his handling of Jef Costello. Early on in Le Samourai there is a moment in which Costello hot-wires a car and drives it to a nearby mechanic waiting for him, ready to change the license plates and I knew then in that moment I was in for something special. It was so strikingly similar to the opening of Drive that I immediately was filled with a sense of joy, and Costello clearly served as the inspiration for Gosling's nameless Driver character. Both handsome, both super cool and both choosing their words as carefully as they cover their tracks. I could watch Le Samourai again and again and again and again, and I'm sure each viewing would lead to new discoveries, enhanced perceptions of scenes I already love and a flourishing man-crush on Alain Delon in that jacket and fedora. Sign me up for all of the above. Scott, have you seen L'armée des ombres (Army of Shadows)? It's a Melville film from 1969, unreleased in the U.S. until 2006, which is when I saw it at a small indie theatre and I've loved it ever since. A bit slow in places but ultimately leaves you contemplating some major existential questions (at least it did for me). I think you'd appreciate it. It's actually the only one of his I've ever seen. Your review (great, as ever) reminds me that there's more to see. Thanks for that. Wow that sounds right up my alley Donna, I absolutely have not seen it. Thank you so much for the recommendation, I really appreciate that. I am just starting my Melville journey so I will add that to the list. You are too kind, thanks for reading!